Powering the global knowledge economy. Creating a shared global superintelligence. 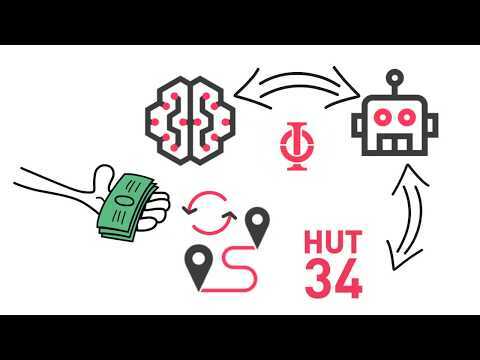 An open distributed interbot network where data, information, and services can be exchanged and monetised fairly by all. Creating a shared global superintelligence. and services can be exchanged and monetised fairly by all. Simple, straightforward connection provides frictionless access to all connected platforms and services. Route unresolved queries to the Hut34 Network. Routing options can be set by the developer to suit their specific needs and requirements. Optimal resolution of user queries through intelligent ranking. Use your Hut, our managed service or another 3rd party service to rank answers returned from the network. Be rewarded fairly for your contribution to the network. Earn Entropy by providing others access to your data, information or domain knowledge. Icodriver...expert launching ICOs, ICO Influencer, IT expert. Good technical team but marketing expertise seems light. The vision is grand but not lucid as to the detail on execution and operation. More information on the state of the product is necessary. Upon successful completion of the token sale we immediately commence build of the Hut34 Network stack, targeting the first pre-alpha release of the network with basic network routing by the end of 2017. A limited set of developers will then be invited and incentivised to develop Bots and set up Huts using Entropy Foundation ENT, with zero-cost transactions. This release will be inline with an update release to the platform that introduces new features along with bug fixes to existing features. An alpha version of the monetised Hut34 stack will be released in Q2 2018. At this stage, developers may establish Huts and purchase ENT, with the first release of the ranking and routing functionality. By the end of the third quarter of 2018, the Hut34 Platform will be made available to bot builders and marketers, along with a full beta version of Hut34 networking capabilities. A portion of Entropy Foundation currency will be used to discount transactions during this time to encourage development, and feedback and usage statistics will be collected in order to improve features and network performance. The fully-functional Hut34 network will be released Q4 2018. Network operations will have been significantly tested and iterated and the entire system will have a year ofl user testing.This will ensure the network is robust and ready to scale, prerequisites for a successful project.